Buffalo is the second largest city in the state of New York and the 81st most populous city in the United States. As of July 2016, the population was 256,902, a slight decrease from the 2010 census. It is the principal municipality of the Buffalo–Niagara Falls metropolitan area, a region with 1,134,210 residents in the MSA and 1,213,668 in the CSA. The city serves as the county seat of Erie County. The city is also a major gateway for commerce and travel for the Canada–United States border, forming part of the bi-national Buffalo Niagara Region. The Buffalo area was inhabited before the 17th century by the Native American Iroquois tribe and later by French settlers. The city grew significantly in the 19th and 20th centuries as a result of immigration, the construction of the Erie Canal, the construction of rail transportation, and its close proximity to Lake Erie. This growth provided an abundance of fresh water and an ample trade route to the Midwestern United States while grooming its economy for the grain, steel and automobile industries that dominated the city's economy during the 20th century. Since the city's economy relied heavily on manufacturing, deindustrialization in the latter half of the 20th century led to a steady decline in population. While some manufacturing activity remains, Buffalo's economy has transitioned to service industries with a greater emphasis on healthcare, research and higher education, which emerged following the Great Recession. Buffalo is located on the eastern shore of Lake Erie, at the head of the Niagara River, and 16 miles south of Niagara Falls. Buffalo is recognized for its early embrace of electric power, owing to the nickname "the City of Light." The city is also famous for its urban planning and layout by Joseph Ellicott, an extensive system of parks designed by Frederick Law Olmsted, as well as significant architectural works spanning multiple centuries. It is a cultural center blending Northeastern and Midwestern United States traditions, with dozens of prominent annual festivals (including Taste of Buffalo and Allentown Art Festival), two professional sports teams (Buffalo Bills and Buffalo Sabres), and a long-standing music and arts scene. There are several theories regarding how Buffalo Creek received its name. While it is possible that its name originated from French fur traders and Native Americans calling the creek Beau Fleuve (French for "Beautiful River"), it is also possible Buffalo Creek was named after the American buffalo, whose historical range may have extended into western New York. Later, during the Beaver Wars of the 1640s-1650s, the combined warriors of the Five Nations of the Iroquois Confederacy conquered the populous Neutrals and their peninsular territory, while the Senecas alone took out the Wenro and their territory, c. 1651–1653. [lower-alpha 1] Soon after, the Erie nation and territory was also destroyed by the Iroquois over their assistance to Huron people during the Beaver Wars. After the American Revolution, the colony of New York—now a state—began westward expansion, looking for habitable land by following trends of the Iroquois. Land close to fresh water was of considerable importance. New York and Massachusetts were fighting for the territory Buffalo lies on, and Massachusetts had the right to purchase all but a one-mile (1600-meter) wide portion of land. The rights to the Massachusetts' territories were sold to Robert Morris in 1791, and two years later to the Holland Land Company. As a result of the war, in which the Iroquois tribe sided with the British Army, Iroquois territory was gradually whittled away in the mid-to-late-1700s by white settlers through successive treaties statewide, such as the Treaty of Fort Stanwix (1784), the First Treaty of Buffalo Creek (1788), and the Treaty of Geneseo (1797). The Iroquois were corralled onto reservations, including Buffalo Creek. By the end of the 18th century, only 338 square miles (Template:Convert/acre km2 ha) of reservation territory remained. In 1804, Ellicott designed a radial grid plan that would branch out from the village forming bicycle-like spokes, interrupted by diagonals, similar to the system used in the nation's capital. In the middle of the village was the intersection of eight streets, in what would become Niagara Square. Several blocks to the southeast he designed a semicircle fronting Main Street with an elongated park green, formerly his estate. This would be known as Shelton Square, at that time the center of the city (which would be dramatically altered in the mid-20th century), with the intersecting streets bearing the names of Dutch Holland Land Company members,[lower-alpha 2] today Erie, Church and Niagara streets. Lafayette Square also lies one block to the north, which was then bounded by streets bearing Iroquois names. Fears of a second British war were stoked in 1812, when on June 27 a small craft carrying salt was captured by two boats on the Niagara River. There were several skirmishes on the water in the following months. On December 18, 1813, Fort Niagara was overrun with ease by 500 British troops and Native American soldiers.Template:Which one Soon after, General Amos Hall ordered two thousand unskilled and drafted troops to march from Batavia to Buffalo, arriving December 26. After the British crossed the Niagara River the night before December 30, Buffalo and the village of Black Rock were burned in a frenzy the next in the Battle of Buffalo. The battle and subsequent fire was in response to the unprovoked destruction of Niagara-on-the-Lake, then known as "Newark," by American forces. While many residents were warned to leave beforehand, those that did not escape were tomahawked and scalped in the ensuing battle. Though only three buildings remained in the village, rebuilding was swift, finishing in 1815. The mid-1800s saw a boom in population, with the city doubling in size from 1845 to 1855. Almost two-thirds of the city's population were foreign-born immigrants in 1855, predominately a mix of unskilled or educated Irish and Germans Catholics, who began self-segregating in different parts of the city. The Irish immigrants planted their roots along the railroad-heavy Buffalo River and Erie Canal to the southeast, to which there is still a heavy presence today; German immigrants found their way to the East Side, living a more laid-back, residential life. Some immigrants were apprehensive about the change of environment and elected to leave the city for the western region, while others tried to stay behind in the hopes of expanding their native cultures. In 1860, there were a plethora of railway companies and lines crossing through and terminating in Buffalo. Major ones were the Buffalo, Bradford and Pittsburgh Railroad (1859), Buffalo and Erie Railroad and the New York Central Railroad (1853). During this time, a quarter of all shipping traffic on Lake Erie was controlled by Buffalo citizens, and shipbuilding itself was a thriving industry for the city. During World War II, Buffalo saw the return of prosperity and full employment due to its position as a manufacturing center. As one of the most populous cities of the 1950s, Buffalo's economy revolved almost entirely on its manufacturing base. Major companies such as Republic Steel and Lackawanna Steel employed tens of thousands of Buffalonians. Integrated national shipping routes would utilize the Soo Locks near Lake Superior and a vast network of railroads and yards that crisscrossed the city. Lobbying by local businesses and interest groups against the St. Lawrence Seaway began in the 1920s, long before its construction in 1957, which cut the city off from valuable trade routes. Its approval was reinfornced by legislation shortly before its construction. Shipbuilding in Buffalo, such as that of the American Ship Building Company, shut down in 1962, ending an industry that had been a sector of the city's economy since 1812, and a direct result of reduced waterfront activity. With deindustrialization, and the nationwide trend of suburbanization; the city's economy began to deteriorate. Like much of the Rust Belt, Buffalo, home to more than half a million people in the 1950s, has seen its population decline as heavy industries shut down and people left for the suburbs or other cities. Buffalo is on Lake Erie's eastern end, opposite Fort Erie, Ontario, Canada. It is located at the origin of the Niagara River, which flows northward over Niagara Falls and into Lake Ontario. The city is 50 miles (80 km) south-southeast from Toronto. Relative to downtown, the city is generally flat with the exception of area surrounding North and High streets, where a hill of 90 feet gradually develops approaching from the south and north. In the Southtowns are the Boston Hills, while the Appalachian Mountains sit in the Southern Tier below them. To the north and east, the region maintains a flatter profile descending to Lake Ontario. Various types of shale, limestone and lagerstätten are prevalent in the geographic makeup of Buffalo and surrounding areas, which line the waterbeds that are within and bordering the city. According to the United States Census Bureau, the city has a total area of 52.5 square miles (136 km2), of which 40.6 square miles (105 km2) is land and the rest water. The total area is 22.66% water. Compared to the national average, Buffalo has a much higher rate of violent crime. In 2015, there were 41 murders, 1,033 robberies, and 1,640 assaults. In 2016, bizjournals.com published an article including an FBI report that ranked Buffalo's violent crime rate as the 15th-worst in the nation. Buffalo's cuisine encompasses a variety of cultural contributions, including Italian, Irish, Jewish, German, Polish, African-American, Greek, and American influences. In 2015, the National Geographic Society ranked Buffalo third on their list of "The World's Top Ten Food Cities". Locally owned restaurants offer Chinese, German, Japanese, Korean, Vietnamese, Thai, Mexican, Italian, Arab, Indian, Caribbean, soul food, and French cuisine. Buffalo's local pizzerias differ from that of the thin-crust New York-style pizzerias and deep-dish Chicago-style pizzerias, and is locally known for being a midpoint between the two. The Beef on weck sandwich, kielbasa, sponge candy, pastry hearts, pierogi and haddock fish fries are local favorites, as is a loganberry-flavored beverage that remains relatively obscure outside of Western New York and Southern Ontario. Teressa Bellissimo first prepared the now widespread Chicken Wings at the Anchor Bar in 1964. Buffalo has several well-known food companies. Non-dairy whipped topping was invented in Buffalo in 1945 by Robert E. Rich, Sr. His company, Rich Products, is one of the city's largest private employers. General Mills was organized in Buffalo, and Gold Medal brand flour, Wheaties, Cheerios and other General Mills brand cereals are manufactured here. Archer Daniels Midland operates its largest flour mill in the city. Buffalo is home to one of the largest privately held food companies in the world, Delaware North Companies, which operates concessions in sports arenas, stadiums, resorts and many state and federal parks. The Taste of Buffalo and National Buffalo Wing Festival showcase food from the Buffalo area. These are two of the many festivals that occur in Buffalo during the summer months. The Allentown Art Festival showcases local and national artists every summer, in Buffalo's Allentown district. Buffalo also has a boomingTemplate:Opinion underground music scene spawning bands such as Snapcase, Lemuria, and Pentimento. The site of the former Erie Canal Harbor, Canalside has become a popular destination for tourists and residents since 2007 when Buffalo and the New York Power Authority began to redevelop the former site of War Memorial Auditorium into historically accurate canals. Buffalo is also home to several minor sports teams, including the Buffalo Bisons (baseball; an affiliate of the MLB's Toronto Blue Jays since 2014), FC Buffalo (soccer) as well as a professional women's team, the Buffalo Beauts (hockey). The Buffalo Bandits indoor lacrosse team was established in 1992 and played their home games in Buffalo Memorial Auditorium until 1996 when they followed the Sabres to Marine Midland Arena. They have won eight division championships and four league championships (1991-1992, 1992-1993, 1995-1996 and 2007-2008). The Buffalo Bulls are a Division I college team representing the State University of New York at Buffalo (which no longer is situated in the city proper); the only Division I college sports program within city limits is the Canisius Golden Griffins. Situated at the confluence of Lake Erie and the Buffalo and Niagara rivers, Buffalo is a waterfront city. The city's rise to economic power came through its waterways in the form of transshipment, manufacturing, and an endless source of energy. Buffalo's waterfront remains, though to a lesser degree, a hub of commerce, trade and industry. Beginning in 2009, a significant portion of Buffalo's waterfront began to be transformed into a focal point for social and recreational activity. To this end, Buffalo Harbor State Park, nicknamed "Outer Harbor," was opened in 2014. Buffalo's intent was to stress its architectural and historical heritage to create a tourism destination, and early data indicates that they were successful. in the House of Representatives, represented by Democrat Brian Higgins. In a trend common to northern "Rust Belt" regions, the Democratic Party has dominated Buffalo's political life for the last half-century. The last time anyone other than a Democrat held the position of Mayor in Buffalo was Chester A. Kowal in 1965. In 1977, Democratic Mayor James D. Griffin was elected as the nominee of two minor parties, the Conservative Party and the Right to Life Party, after he lost the Democratic primary for Mayor to then Deputy State Assembly Speaker Arthur Eve. Griffin switched political allegiances several times during his 16 years as Mayor, generally hewing to socially conservative platforms. His successor, Democrat Anthony M. Masiello (elected in 1993) continued to campaign on social conservatism, often crossing party lines in his endorsements and alliances. However, in 2005, Democrat Byron Brown was elected the city's first African-American mayor in a landslide (64%–27%) over Republican Kevin Helfer, who ran on a conservative platform. In 2013, the Conservative Party endorsed Brown for a third term because of his pledge to cut taxes. This change in local politics was preceded by a fiscal crisis in 2003 when years of economic decline, a diminishing tax-base and civic mismanagement left the city deep in debt and on the edge of bankruptcy. At New York State Comptroller Alan Hevesi's urging, the state took over the management of Buffalo's finances, appointing the Buffalo Fiscal Stability Authority. Mayor Tony Masiello began conversations about merging the city with the larger Erie County government the following year, but they came to nought. Buffalo's magnet school system features schools that attract students with special interests, such as science, bilingual studies, and Native American studies. Specialized facilities include the Buffalo Elementary School of Technology; the Dr Martin Luther King Jr., Multicultural Institute; the International School; the Dr. Charles R. Drew Science Magnet; BUILD Academy; Leonardo da Vinci High School; PS 32 Bennett Park Montessori; the Buffalo Academy for Visual and Performing Arts, BAVPA; the Riverside Institute of Technology; Lafayette High School/Buffalo Academy of Finance; Hutchinson Central Technical High School; Burgard Vocational High School; South Park High School; and the Emerson School of Hospitality. The State University of New York (SUNY) operates three institutions within the city of Buffalo. The University at Buffalo is known as "UB" and is the largest public university in New York. The University at Buffalo is the only university in Buffalo and is a nationally ranked tier 1 research university. Buffalo State College and Erie Community College are a college and a community college, respectively. Additionally, the private institutions Canisius College and D'Youville College are within the city. Eight New York State highways, one three-digit Interstate Highway and one U.S. Highway traverse the city of Buffalo. New York State Route 5, commonly referred to as Main Street within the city, enters through Lackawanna as a limited-access highway and intersects with Interstate 190, a north-south highway connecting Interstate 90 in the southeastern suburb of Cheektowaga with Niagara Falls. NY 354 (Clinton Street) and NY 130 (Broadway) are east to west highways connecting south and downtown Buffalo to the eastern suburbs of West Seneca and Depew. NY 265 (Delaware Avenue) and NY 266 (Niagara Street and River Road) both start in downtown Buffalo and end in the city of Tonawanda. One of three U.S. highways in Erie County, the other two being U.S. 20 (Transit Road) and U.S. 219 (Southern Expressway), U.S. 62 (Bailey Avenue) is a north to south trunk road that enters the city through Lackawanna and exits at the Amherst town border at a junction with NY 5. Within the city, the route passes by light industrial developments and high-density areas of the city. Bailey Avenue has major intersections with Interstate 190 and the Kensington Expressway. Three major expressways serve the city of Buffalo. The Scajaquada Expressway (NY 198) is primarily a limited access highway connecting Interstate 190 near Unity Island to New York State Route 33, which starts at the edge of downtown and the city's East Side, continues through heavily populated areas of the city, intersects with Interstate 90 in Cheektowaga and ends at the airport. The Peace Bridge is a major international crossing near the city's Black Rock district, connecting Buffalo with Fort Erie and Toronto via the Queen Elizabeth Way. Buffalo's water system is operated by Veolia Water. To reduce large-scale ice blockage in the Niagara River, with resultant flooding, ice damage to docks and other waterfront structures, and blockage of the water intakes for the hydro-electric power plants at Niagara Falls, the New York Power Authority and Ontario Power Generation have jointly operated the Lake Erie-Niagara River Ice Boom since 1964. The boom is installed on December 16, or when the water temperature reaches 4 °C (39 °F), whichever happens first. The boom is opened on April 1 unless there is more than 650 square kilometres (250 sq mi) of ice remaining in Eastern Lake Erie. When in place, the boom stretches 2,680 metres (8,790 ft) from the outer breakwall at Buffalo Harbor almost to the Canadian shore near the ruins of the pier at Erie Beach in Fort Erie. The boom was originally made of wooden timbers, but these have been replaced by steel pontoons. Buffalo's major newspaper is The Buffalo News. Established in 1880 as the Buffalo Evening News, the newspaper has 181,540 in daily circulation and 266,123 on Sundays. With the radio stations WBEN (later WBEN-AM), WBEN-FM, and television station WBEN-TV, Buffalo’s first and for several years only television station, the Buffalo Evening News dominated the local media market until 1977, when the newspaper and the stations were separated. The stations showed their affiliation with the newspaper in their call sign: WBEN. Other newspapers in the Buffalo area include Artvoice, The Public, Buffalo Business First, the Spectrum—University at Buffalo's student-run newspaper—and the Record, Buffalo State College's student-run newspaper. Online news magazines include Artvoice Daily Online and Buffalo Rising, formerly a print magazine. The Buffalo area is home to 14 AM stations and 21 FM stations. Major station operators include Entercom, Townsquare Media and Cumulus Media. In addition, National Public Radio operates a publicly funded station, WBFO 88.7. According to Nielsen Media Research, the Buffalo television market is the 52nd largest in the United States as of 2013. Although no major cable outlets have offices or bureaus in the Buffalo area, the four major networks have established affiliates in the area: WGRZ 2 (NBC), WIVB-TV 4 (CBS), WUTV 29 (FOX), and WKBW-TV 7 (ABC). Other stations in Buffalo with network affiliations include publicly funded WNED-TV 17 (PBS), WNLO 23 (The CW), WNYO-TV 49 (MyNetworkTV), and WBBZ-TV 67 (MeTV/independent). The area's major cable provider is Spectrum, which operates the system-exclusive Spectrum News Buffalo, part of the statewide Spectrum News network. The Buffalo market also has access to multiple Canadian broadcast stations over-the-air from the Hamilton and Toronto areas, though only CBLT 5 (CBC) and CFTO 9 (CTV) are carried on Time Warner Cable. ^ a b "Population and Housing Unit Estimates". https://factfinder.census.gov/faces/tableservices/jsf/pages/productview.xhtml?src=bkmk. Retrieved May 29, 2018. ^ Severance, Frank H. (1902). "The Achievements of Captain John Montresor". In Buffalo Historical Society. Buffalo Historical Society Publications. Buffalo, NY: Bigelow Brothers. p. 15. Archived from the original on September 16, 2015. https://books.google.com/books?id=pBs8AAAAIAAJ&pg=PA15. ^ Hornaday, William T. (1889). "Geographic Distribution". The Extermination of the American Bison. Washington D.C.: Government Printing Office. pp. 385–386. Archived from the original on September 24, 2015. https://www.gutenberg.org/files/17748/17748-h/17748-h.htm#ii_geographical_distribution. Retrieved August 20, 2015. ^ a b c Editor: Alvin M. Josephy, Jr., by The editors of American Heritage Magazine (1961). "The American Heritage Book of Indians". In pages 187–219. ,. American Heritage Publishing Co., Inc.. p. 189. ^ Houghton, Frederick (1927). "The Migrations of the Seneca Nation". American Anthropologist 29: 241–250. DOI:10.1525/aa.1927.29.2.02a00050. ^ Donehoo, George P. (1922). The Indians of the Past and of the Present. The Pennsylvania Magazine of History and Biography. pp. 181. https://archive.org/details/jstor-20086480. ^ Bartlett, George Hunter (1922). Recalling Pioneer Days. The Buffalo Historical Society. pp. 3. http://hdl.handle.net/2027/wu.89065904492. ^ Stewart, John (1899). "Early Maps and Surveyors of the City of Washington, D. C.". Records of the Columbia Historical Society, Washington, D.C. 2. DOI:10.2307/40066723. ^ a b Fernald, Frederik Atherton (1910). The index guide to Buffalo and Niagara Falls. The Library of Congress. Buffalo, N.Y., F.A. Fernald. pp. 21. Archived from the original on March 26, 2017. https://archive.org/details/indexguidetobuff00fern. ^ Clinton, George W.; Hunt, Sanford B. (1862). Thomas' Buffalo City Directory for 1862, to which is Prefixed a Sketch of the Early History of Buffalo. Buffalo, NY: E.A. Thomas, Franklin Steam Printing House. p. 16. Archived from the original on September 25, 2015. https://books.google.com/books?id=ooMUAAAAYAAJ&pg=PA16#v=onepage&q&f=false. Retrieved August 31, 2015. ^ Elmendorf, Dwight L. (March 1913). "Washington the Capital". The Mentor 1. ^ Powell, Elwin Humphreys (1988-01-01) (in en). The Design of Discord: Studies of Anomie. Transaction Publishers. pp. 59. ISBN 9781412836494. ^ Myers, Stephen G. (2012) (in en). Buffalo. Arcadia Publishing. pp. 25. ISBN 9780738591650. ^ Myers, Stephen G. (2012) (in en). Buffalo. Arcadia Publishing. ISBN 9780738591650. ^ Buffalo Historical Society (1882) (in en). Semi-centennial Celebration of the City of Buffalo: Address of the Hon. E.C. Sprague Before the Buffalo Historical Society, July 3, 1882. Buffalo, N.Y.: Buffalo Historical Society. pp. 20, 21. ^ Becker 1906, p. 119. ^ Becker 1906, pp. 120–121. ^ a b Berton, Pierre (1981). Flames across the border : the Canadian-American tragedy, 1813-1814. Boston : Little, Brown. pp. 126, 262–268. ISBN 9780316092173. OCLC 421827788. https://archive.org/details/flamesacrossbord00bert_0. ^ Becker 1906, pp. 126–127. ^ a b c Severance, Frank H. (1879). "Papers relating to the Burning of Buffalo". Publications of the Buffalo Historical Society. Harold B. Lee Library. Buffalo : Bigelow Bros.. pp. 334–356. https://archive.org/details/publicationsofbu09seve. ^ Quimby, Robert (1997). The U.S. Army in the War of 1812: An Operational and Command Study. East Lansing, MI: Michigan State University Press. pp. 355. ISBN 0-87013-441-8. ^ Gee, Denise Jewell (2013-12-30). "200 years ago, the village of Buffalo burned". Archived from the original on February 27, 2017. http://buffalonews.com/2013/12/30/200-years-ago-the-village-of-buffalo-burned/. ^ "The Buffalo of Yesteryear: Chictawauga, Scajaquady and the 'morass' that was Buffalo" (in en-US). The Buffalo News. 2017-11-29. Archived from the original on November 29, 2017. https://web.archive.org/web/20171129200743/http://buffalonews.com/2017/11/29/the-buffalo-of-yesteryear-chictawauga-scajaquady-and-other-oddities-of-the-year-1860/. ^ Becker 1906, p. 131. ^ "Erie Canal opens". Archived from the original on October 14, 2014. http://www.history.com/this-day-in-history/erie-canal-opens. Retrieved October 29, 2014. ^ (in en) Proceedings of the Common Council of the City of Buffalo. James D. Warren's Sons Co.. 1909. pp. 2262. ^ "Canal History". New York State Canal Corporation. Archived from the original on March 7, 2016. http://www.canals.ny.gov/history/history.html. Retrieved October 29, 2014. ^ Champieux, Robin (April 2003). "John W. Clark papers". University of Michigan. Archived from the original on October 29, 2014. http://quod.lib.umich.edu/c/clementsmss/umich-wcl-M-3470cla?view=text. Retrieved October 29, 2014. ^ a b "A Brief Chronology of the Development of the City of Buffalo". Archived from the original on November 4, 2014. http://www.nps.gov/thri/buffalotimeline.htm. Retrieved October 29, 2014. ^ (in en) The Manufacturing Interests of the City of Buffalo: Including Sketches of the History of Buffalo. With Notices of Its Principal Manufacturing Establishments. C.F.S. Thomas. 1866. pp. 13. ^ Savage, Beth L.; Shull, Carol D. (1994) (in en). African American Historic Places. Washington, D.C.: Preservation Press. pp. 346–347. ISBN 9780471143451. OCLC 30976865. ^ Priebe Jr., J. Henry. "The City of Buffalo 1840–1850". Archived from the original on September 5, 2013. https://web.archive.org/web/20130905173951/http://history.buffalonet.org/1840-50.html. Retrieved September 9, 2007. ^ Baxter, Henry. "Grain Elevators". Buffalo and Erie County Historical Society. Archived from the original on October 13, 2014. http://bechsed.nylearns.org/pdf/Buffalos_Grain_Elevators.pdf. Retrieved October 29, 2014. ^ Kowsky, Francis R. (2006). "Monuments of a Vanished Prosperity: Buffalo's Grain Elevators and the Rise and Fall of the Great Transnational System of Grain Transport". In Schneekloth, Lynda H.. Reconsidering Concrete Atlantis: Buffalo Grain Elevators. The Urban Design Project, School of Architecture and Planning, University at Buffalo. pp. 24–25. Archived from the original on September 27, 2016. http://regional-institute.buffalo.edu/wp-content/uploads/sites/3/2014/06/Reconsidering-Concrete-Atlantis-Buffalo-Grain-Elevators1.pdf. Retrieved September 25, 2016. ^ "President William McKinley is shot". 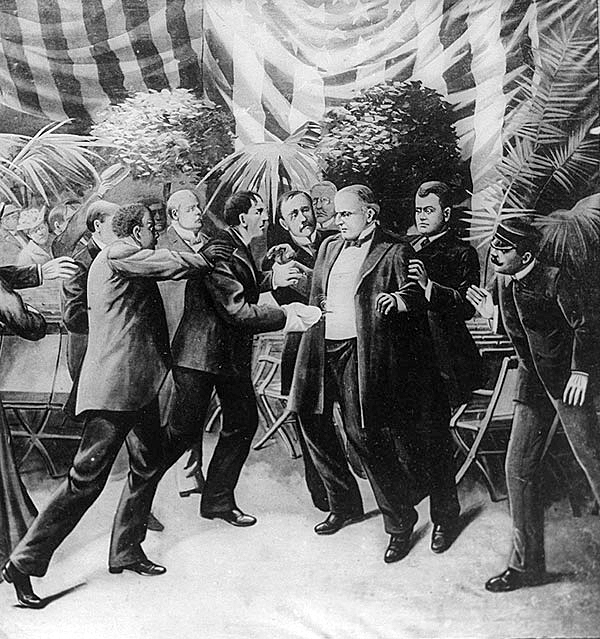 Archived from the original on October 14, 2014. http://www.history.com/this-day-in-history/president-william-mckinley-is-shot. Retrieved November 2, 2014. ^ a b "Swearing-In Ceremony for President Theodore Roosevelt". Archived from the original on November 1, 2014. https://web.archive.org/web/20141101195558/http://www.inaugural.senate.gov/swearing-in/event/theodore-roosevelt-1901. Retrieved November 2, 2014. ^ "1941–1945". History. Parkside Community Association. Archived from the original on July 8, 2010. https://web.archive.org/web/20100708014105/http://www.parksidebuffalo.org/history.html. ^ Rizzo, Michael. "Joseph J. Kelly 1942–1945". Through The Mayor's Eyes. The Buffalonian. Archived from the original on September 26, 2011. https://web.archive.org/web/20110926220745/http://www.buffalonian.com/history/industry/mayors/Kelly.htm. ^ a b "Back in business". The Economist (The Economist Newspaper Limited). June 30, 2012. Archived from the original on October 30, 2014. https://web.archive.org/web/20141030123148/http://www.economist.com/node/21557797. Retrieved November 2, 2014. ^ "Population of the 100 Largest Urban Places: 1950". June 15, 1998. Archived from the original on August 24, 2014. https://www.census.gov/population/www/documentation/twps0027/tab18.txt. Retrieved November 2, 2014. ^ Koritz, Douglas. "Restructuring or Destructuring?" (in en). Urban Affairs Quarterly 26 (4): 497–511. DOI:10.1177/004208169102600403. ^ The Editors of Encyclopædia Britannica (June 23, 2014). "Buffalo, New York". Encyclopædia Britannica, Inc.. Archived from the original on February 2, 2017. https://www.britannica.com/place/Buffalo-New-York. ^ Editors (2010-05-17). "Encyclopaedia Britannica". Encyclopaedia Britannica, INc.. Archived from the original on February 2, 2017. https://www.britannica.com/place/Niagara-River. ^ Luther, D. D. (1906) (in English). Geologic map of the Buffalo quadrangle. Columbia University Libraries. New York State Education Dept.. https://archive.org/details/ldpd_6985187_000. ^ "UB Geologists Find Evidence That Upstate New York Is Criss-Crossed By Hundreds Of Faults - University at Buffalo" (in en). http://www.buffalo.edu/news/releases/2000/03/4637.html. ^ Smith, Henry Perry (1884). History of the city of Buffalo and Erie County : with ... biographical sketches of some of its prominent men and pioneers .... Syracuse, N.Y.: D. Mason & Co.. pp. 16. https://archive.org/details/historyofcityofb01smit. ^ Ouroussoff, Nicolai (November 14, 2008). "Saving Buffalo's Untold Beauty". The New York Times. Archived from the original on October 6, 2014. https://web.archive.org/web/20141006193136/http://www.nytimes.com/2008/11/16/arts/design/16ouro.html?pagewanted=all&_r=0. Retrieved September 19, 2014. ^ "Buffalo, NY". Forbes.com LLC. Archived from the original on October 7, 2014. https://www.forbes.com/places/ny/buffalo/. Retrieved September 19, 2014. ^ Karson, Robin (January 21, 2014). The Best Planned City: Olmsted, Vaux, and the Buffalo Park System (Motion picture). Library of American Landscape History. https://www.youtube.com/watch?v=Kht84XaSn2M. ^ "Louis Sullivan still has a skyscraper in Buffalo, but Chicago has none". Archived from the original on September 25, 2015. http://articles.chicagotribune.com/2013-09-01/news/ct-met-kamin-sullivanbuffalo-0901-20130902_1_skyscrapers-auditorium-building-wainwright-building. Retrieved 2015-09-23. ^ E. Kaplan, Marilyn (June 1989). "Preservation Tech Notes: Guaranty Building". Archived from the original on January 13, 2016. http://www.nps.gov/tps/how-to-preserve/tech-notes/Tech-Notes-Mechanical01.pdf. Retrieved September 23, 2015. ^ Miller, Melinda (November 17, 2013). "Preparing for 38 floors of emptiness at One Seneca Tower". Archived from the original on September 26, 2015. http://www.buffalonews.com/city-region/downtown-waterfront/preparing-for-38-floors-of-emptiness-at-one-seneca-tower-20131117. Retrieved 2015-09-26. ^ (2007) "Updated world map of the Köppen–Geiger climate classification". Hydrol. Earth Syst. Sci. 11: 1633–1644. DOI:10.5194/hess-11-1633-2007. ISSN 1027-5606. ^ a b c d e f g "Buffalo's Climate". National Weather Service. Archived from the original on September 24, 2015. http://www.erh.noaa.gov/buf/bufclifo.htm. Retrieved 2015-08-19. ^ Madsen, Steve. "Comparison Golden Snowball City Stats 1940 – 2007". Goldensnowball. Archived from the original on February 8, 2014. https://web.archive.org/web/20140208002625/http://www.goldensnowball.com/yearly-winners-golden-award.htm. , Retrieved May 31, 2013. ^ WeatherBug Meteorologists (January 3, 2012). "What Are The Snowiest Cities in the U.S.?". Weatherbug. Archived from the original on May 13, 2014. https://web.archive.org/web/20140513164022/http://weatherbug.excite.com/StormCentral/Excite/StormCentral.aspx?no_cookie_zip=90012&no_cookie_stat=LNFR3&no_cookie_world_stat=&zcode=z4639&story_id=6117&lid=SCSPS. , Retrieved May 31, 2013. ^ "Buffalo remembers infamous blizzard of '77". June 1, 2002. http://usatoday30.usatoday.com/weather/wbufbliz.htm. Retrieved 2015-09-19. ^ "Buffalo socked by wintry October surprise". WISTV. October 13, 2006. Archived from the original on October 6, 2014. https://web.archive.org/web/20141006104339/http://www.wistv.com/story/5534235/buffalo-socked-by-wintry-october-surprise. Retrieved September 30, 2014. ^ "October Surprise Storm: 7th Anniversary". Gannett. Archived from the original on October 1, 2014. https://archive.is/20141001015504/http://archive.wgrz.com/news/photo-gallery.aspx?storyid=229120. ^ McClam, Erin; Arkin, Daniel (November 20, 2014). "Buffalo, Western New York Buried by Another Wave of Snow – NBC News". Archived from the original on September 30, 2015. http://www.nbcnews.com/news/weather/buffalo-new-york-set-more-snow-thaw-expected-weekend-n251436. Retrieved 2015-09-19. ^ "Record high of 99 °F (37 °C) was recorded in August 1948". Weather.com. July 27, 2012. Archived from the original on December 7, 2013. https://web.archive.org/web/20131207164221/http://www.weather.com/weather/wxclimatology/monthly/graph/USNY0181?from=tenDay_bottomnav_undeclared. ^ "August Daily Averages for Buffalo, NY". weather.com. Archived from the original on March 16, 2014. https://web.archive.org/web/20140316225542/http://www.weather.com/outlook/health/fitness/wxclimatology/daily/USNY0181?climoMonth=8. Retrieved December 6, 2011. ^ "February Daily Averages for Buffalo, NY". weather.com. Archived from the original on March 16, 2014. https://web.archive.org/web/20140316225755/http://www.weather.com/outlook/health/fitness/wxclimatology/daily/USNY0181?climoMonth=2. Retrieved December 6, 2011. ^ United States Census Bureau. "Census of Population and Housing". Archived from the original on April 22, 2013. https://www.webcitation.org/6G4J8TS75?url=http://www.census.gov/prod/www/decennial.html. Retrieved June 14, 2013. ^ "Annual Estimates of the Resident Population: April 1, 2010 to July 1, 2012". https://www.census.gov/popest/data/cities/totals/2012/SUB-EST2012-3.html. Retrieved June 14, 2013. ^ "Buffalo (city), New York". United States Census Bureau. Archived from the original on May 4, 2014. https://web.archive.org/web/20140504172555/http://quickfacts.census.gov/qfd/states/36/3611000.html. ^ "Buffalo Demographics: 2010". quickfacts.census.go. Archived from the original on May 4, 2014. https://web.archive.org/web/20140504172555/http://quickfacts.census.gov/qfd/states/36/3611000.html. Retrieved November 8, 2011. ^ Zremski, Jerry; Gee, Derek (October 16, 2016). "From Burma to Buffalo, The refugee wave is changing our city". The Buffalo News. Archived from the original on October 21, 2016. https://web.archive.org/web/20161021002747/http://projects.buffalonews.com/long-reads/burma/index.html. Retrieved October 20, 2016. ^ Rott, Jerry (July 26, 2013). "List: Largest Employers". American City Business Journals. Archived from the original on December 5, 2014. http://www.bizjournals.com/buffalo/subscriber-only/2013/07/26/list-largest-employers.html. Retrieved September 19, 2014. ^ "Poverty USA – Catholic Campaign for Human Development – A hand up, not a hand out". Usccb.org. July 27, 2011. Archived from the original on July 10, 2011. https://web.archive.org/web/20110710140234/http://www.usccb.org/cchd/povertyusa/povfact6.shtml. ^ Buffalo 3rd Poorest Large City Script error. WGRZ TV. Retrieved October 14, 2008. ^ "Buffalo Market Trends". Archived from the original on September 9, 2014. http://www.trulia.com/real_estate/Buffalo-New_York/market-trends/. Retrieved September 19, 2014. ^ "Buffalo Economy News". City of Buffalo. Archived from the original on October 6, 2014. http://www.ci.buffalo.ny.us/Home/Leadership/City_Comptroller/economy. Retrieved October 5, 2014. ^ "Signs of economic revival finally appear". Archived from the original on October 6, 2014. http://www.buffalonews.com/feed/signs-of-economic-revival-finally-appear-20140125. Retrieved October 5, 2014. ^ New York State Department of Labor (April 21, 2015). "State Labor Department Releases Preliminary March 2015 Area Unemployment Rates". Archived from the original on March 31, 2015. https://web.archive.org/web/20150331041954/http://labor.ny.gov/stats/pressreleases/prlaus.shtm. Retrieved April 28, 2015. ^ National Conference of State Legislatures (April 3, 2015). "National Employment Monthly Update". Archived from the original on April 14, 2015. http://www.ncsl.org/research/labor-and-employment/national-employment-monthly-update.aspx. Retrieved April 28, 2015. ^ Thomas, G. Scott (February 16, 2016). "Which industries are driving the Buffalo area's economy? Here are the top 10". Buffalo Business First. Archived from the original on April 10, 2016. https://web.archive.org/web/20160410111035/http://www.bizjournals.com/buffalo/news/2016/02/16/which-industries-are-driving-the-buffalo-areas.html. Retrieved 16 February 2016. ^ "Crime rate in Buffalo, New York (NY): murders, rapes, robberies, assaults, burglaries, thefts, auto thefts, arson, law enforcement employees, police officers, crime map". Archived from the original on August 4, 2017. http://www.city-data.com/crime/crime-Buffalo-New-York.html. Retrieved 4 August 2017. ^ Thomas, G. Scott. "New FBI report: Buffalo’s violent-crime rate is 15th-worst in the nation". Archived from the original on August 4, 2017. https://www.bizjournals.com/buffalo/news/2016/09/26/violentcrimes.html. Retrieved 4 August 2017. ^ "The World's Top Ten Food Cities". National Geographic. February 2015. Archived from the original on August 11, 2015. http://travel.nationalgeographic.com/travel/top-10/food-cities/. Retrieved July 30, 2015. ^ "Famous Buffalo and Western New York Foods, Restaurants & Food Festivals". Buffalo Chow.com. Archived from the original on September 7, 2013. https://web.archive.org/web/20130907140932/http://www.buffalochow.com/buffalofoods.html. Retrieved July 3, 2009. ^ "Top 100 Buffalo/WNY Foods (and Restaurants), Part 1 of 5". Buffalo Chow.com. February 10, 2009. Archived from the original on September 13, 2013. https://web.archive.org/web/20130913043005/http://www.buffalochow.com/2009/02/top_100_buffalowny_foods_and_r.html. Retrieved July 3, 2009. ^ Addotta, Kip. "Pizza!". Kip Addotta dot com. Archived from the original on September 20, 2012. https://web.archive.org/web/20120920070248/http://www.kipaddotta.com/food/pizza.html. Retrieved July 3, 2009. ^ Horwitz, Jeremy (January 2008). "Loganberry: The Buffalo Drink You'll Like or Love". Buffalo Chow.com. Archived from the original on September 6, 2013. https://web.archive.org/web/20130906215139/http://www.buffalochow.com/2008/01/loganberry_the_buffalo_drink_y.html. Retrieved July 3, 2009. ^ Trillin, Calvin. "The New Yorker". The New Yorker. Archived from the original on December 13, 2013. https://web.archive.org/web/20131213154600/http://www.newyorker.com/archive/1980/08/25/1980_08_25_082_TNY_CARDS_000331411. ^ Shurtleff, William; Aoyagi, Akiko (2013). History of Non-Dairy Whip Topping, Coffee Creamer, Cottage Cheese, and Icing/Frosting (With and Without Soy) (1900–2013). pp. 6. ISBN 978-1-928914-62-4. Archived from the original on December 21, 2016. http://www.soyinfocenter.com/pdf/170/Whip.pdf. ^ "Leading Businesses and Brands". Archived from the original on September 28, 2014. https://web.archive.org/web/20140928160312/http://www.buffaloniagara.org/Doing_Business/TopBusinesses. Retrieved September 19, 2014. ^ World Grain Staff (May 13, 2013). "ADM to reopen flour mill after fire". World-Grain Report. http://www.world-grain.com/News/News%20Home/World%20Grain%20News/2013/5/ADM%20to%20reopen%20flour%20mill%20after%20fire.aspx?cck=1. , Retrieved May 31, 2013. ^ "Who We Are – A Global Leader in Hospitality and Food Service". Delaware North Companies Homepage. Archived from the original on January 26, 2014. https://web.archive.org/web/20140126012255/http://www.delawarenorth.com/Who-We-Are.aspx. Retrieved July 3, 2009. ^ Algonquin Studios. "City of Buffalo Public Art Collection". City-buffalo.com. Archived from the original on June 3, 2013. https://web.archive.org/web/20130603122228/http://www.city-buffalo.com/files/1_2_1/Public%20Art%20Website/Web%20Pages/Public%20Art%20Main%20Page.html. ^ "Burchfield Penney Art Center" (in en). https://www.burchfieldpenney.org/. ^ Menzie, Karol. "Top 25 Mid-Size Cities for Art". AmericanStyle. Archived from the original on September 24, 2014. https://web.archive.org/web/20140924075804/http://www.americanstyle.com/2012/06/top-25-mid-size-cities-for-art/. Retrieved September 19, 2014. ^ Healy, Patrick (2011-12-23). "Shea's Performing Arts Center in Buffalo". The New York Times. ISSN 0362-4331. Archived from the original on October 13, 2015. https://web.archive.org/web/20151013095812/http://www.nytimes.com/2011/12/24/theater/sheas-performing-arts-center-in-buffalo.html. ^ Unofficial, Unbiased Guide to the 331 Most Interesting Colleges 2005. Simon and Schuster. 2004. Archived from the original on July 5, 2014. https://books.google.com/books?id=gxPpANrm2RYC&pg=PA459&dq=%22buffalo+theater+district%22&hl=en&sa=X&ei=Lzo6UequI47p0QHM7YGIBg&ved=0CEQQ6AEwBA#v=onepage&q=%22buffalo%20theater%20district%22&f=false. Retrieved March 8, 2013. ^ Jim Volz (2007). The Back Stage Guide to Working in Regional Theater: Jobs for Actors. Random House. Archived from the original on January 14, 2016. https://books.google.com/books?id=AA8C74_74_sC&pg=PA271&dq=%22buffalo+theater+district%22&hl=en&sa=X&ei=Lzo6UequI47p0QHM7YGIBg&ved=0CEoQ6AEwBQ#v=onepage&q=%22buffalo%20theater%20district%22&f=false. Retrieved March 8, 2013. ^ Mary Burzlaff Bostic (2010). 2011 Photographer's Market. Writer's Digest. Archived from the original on July 5, 2014. https://books.google.com/books?id=tt-CZenafyIC&pg=PA355&dq=%22buffalo+theater+district%22&hl=en&sa=X&ei=Lzo6UequI47p0QHM7YGIBg&ved=0CFUQ6AEwBw#v=onepage&q=%22buffalo%20theater%20district%22&f=false. Retrieved March 8, 2013. ^ "History of the BPO". Archived from the original on August 10, 2014. https://web.archive.org/web/20140810050918/http://bpo.org/about/mission-and-history/history-of-the-bpo/. Retrieved 2014-09-19. ^ "E.M. Cotter". Archived from the original on September 20, 2014. http://www.emcotter.com/home%20page.htm. Retrieved September 19, 2014. ^ "The Buffalo & Erie County Historical Society Buffalo New York". Bechs.org. Archived from the original on October 27, 2013. https://web.archive.org/web/20131027203636/http://www.bechs.org/. ^ "Buffalo Museum of Science – Home". Sciencebuff.org. Archived from the original on April 24, 2014. https://web.archive.org/web/20140424164814/http://www.sciencebuff.org/. ^ "Buffalo Zoo Mission Statement". Archived from the original on September 9, 2014. http://www.buffalozoo.org/mission_statement.html. Retrieved September 19, 2014. ^ "Dyngus Day America". Archived from the original on March 24, 2016. http://www.dyngusday.com/. ^ Besecker, Aaron (Aug 18, 2016). "It's official: The Ralph will be called New Era Field". The Buffalo News. Archived from the original on August 23, 2016. https://web.archive.org/web/20160823170758/http://bills.buffalonews.com/2016/08/18/official-ralph-will-called-new-era-field/. ^ "The Conservancy". Buffalo Olmsted Parks Conservancy. 2016. Archived from the original on October 13, 2016. https://www.bfloparks.org/about/. Retrieved August 24, 2016. ^ Mark Sommer (August 27, 2014). "Buffalo's first state park to start taking shape on outer harbor". Archived from the original on September 5, 2015. http://www.buffalonews.com/city-region/downtown-waterfront/buffalo8217s-first-state-park-to-start-taking-shape-on-outer-harbor-20140827. Retrieved April 12, 2015. ^ "2015 Business Plan". Visit Buffalo Niagara. 2015. Archived from the original on September 10, 2016. http://www.visitbuffaloniagara.com/content/uploads/2015/02/VBN-business-plan-2015.pdf. ^ "FBI Buffalo Division". Buffalo.fbi.gov. March 29, 2011. Archived from the original on March 10, 2011. https://web.archive.org/web/20110310043306/http://buffalo.fbi.gov/. ^ "SUNY Buffalo Regional Knowledge Network". Archived from the original on March 22, 2012. https://web.archive.org/web/20120322060017/http://rkn.buffalo.edu/data/topicdata.cfm?Topic=100&Region=777. ^ "Buffalo Seminary". Buffalo Seminary. Archived from the original on April 24, 2014. https://web.archive.org/web/20140424223619/http://www.buffaloseminary.org/. ^ "Buffalo Public Schools Adult and Continuing Education Division". Archived from the original on October 31, 2013. https://web.archive.org/web/20131031044919/http://upskill.org/. ^ "CTE High School Programs". Buffaloschools.org. http://www.buffaloschools.org/Career_Technical.cfm?subpage=124. Retrieved May 31, 2013. ^ "SUNY: Complete Campus List". Suny.edu. http://www.suny.edu/student/campuses_complete_list.cfm. Retrieved 2011-11-23. ^ "SUNY Buffalo US News and World Report: National University Ranking". USnews. Archived from the original on April 21, 2016. http://colleges.usnews.rankingsandreviews.com/best-colleges/ub-9554. Retrieved 2016-03-31. ^ McLaren, Patrick (2008-07-01). "Sediment Transport and Contaminant Behavior in the Buffalo River, New York: Implications for River Management". Journal of Coastal Research: 955. DOI:10.2112/06-0802.1. ISSN 0749-0208. ^ "Car Ownership in U.S. Cities Data and Map". http://www.governing.com/gov-data/car-ownership-numbers-of-vehicles-by-city-map.html. Retrieved May 3, 2018. ^ Veolia Water (2012). "Treatment – Buffalo Water". Archived from the original on February 6, 2015. http://www.buffalowater.org/Treatment. Retrieved April 21, 2015. ^ The International Niagara Board of Control of the International Joint Commission (November 1999). "Lake Erie-Niagara River Ice Boom Information Sheet". International Joint Commission. Archived from the original on September 24, 2015. http://www.ijc.org/rel/boards/niagara/ice_glace-info_e.pdf. Retrieved April 21, 2015. ^ "Local Television Market Universe Estimates". Nielsen Media Research. http://www.nielsen.com/content/dam/corporate/us/en/docs/solutions/measurement/television/2013-2014-DMA-Ranks.pdf. Retrieved March 31, 2015. ^ a b c d e f g h i j Simon, Jeff (April 17, 2011). "Buffalo's star turn". Archived from the original on September 27, 2016. http://www.buffalonews.com/buffaloaposs_star_turn.html. Retrieved September 25, 2016. ^ a b c ""Marshall" isn't the first movie to be filmed in Buffalo". May 23, 2016. Archived from the original on September 27, 2016. http://www.wkbw.com/news/marshall-isnt-the-first-movie-to-be-filmed-in-buffalo. Retrieved September 25, 2016. ^ Belcher, Mark (April 15, 2016). "Buffalo to be taken over by Teenage Mutant Ninja Turtles for two weeks". Archived from the original on February 20, 2016. http://wivb.com/2015/04/15/buffalo-opens-up-for-teenage-mutant-ninja-turtles-2-but-shuts-down-some-roads/. Retrieved September 25, 2016. ^ Buckley, Eileen. "Locally-shot 'The American Side' to premiere in Buffalo" (in en). Archived from the original on September 23, 2017. https://web.archive.org/web/20170923002823/http://news.wbfo.org/post/locally-shot-american-side-premiere-buffalo. ^ Pignataro, T.J. (January 12, 2013). "Hopes for 'Draft Day' film may rest on financing". Archived from the original on September 27, 2016. http://www.buffalonews.com/apps/pbcs.dll/article?aid=/20130112/cityandregion/130119679/1153. Retrieved September 25, 2016. ^ a b c d e f g h i j k l m n o p q r s t "Interactive City Directory: Buffalo, New York". Washington DC, USA: Sister-cities International. Archived from the original on April 2, 2015. http://www.sister-cities.org/interactive-map/Buffalo,%20New%20York. Retrieved March 14, 2015. , Retrieved May 31, 2013. ^ "Siena, Italy – City of Buffalo". City of Buffalo, New York. Archived from the original on September 28, 2011. https://web.archive.org/web/20110928075329/http://www.ci.buffalo.ny.us/Home/OurCity/Buffalo_Sister_Cities/Siena_Italy. Retrieved December 24, 2008. ^ "Buffalo-Kanazawa Sister City Committee". Japan in Buffalo.org.. Archived from the original on July 22, 2015. https://web.archive.org/web/20150722085055/http://www.japaninbuffalo.org/bksc.html. ^ "Dortmund, Germany – City of Buffalo". City of Buffalo, New York. Archived from the original on September 28, 2011. https://web.archive.org/web/20110928075214/http://www.ci.buffalo.ny.us/Home/OurCity/Buffalo_Sister_Cities/Dortmund_Germany. Retrieved December 24, 2008. ^ "Serwis informacyjny UM Rzeszów – Informacja o współpracy Rzeszowa z miastami partnerskimi". www.rzeszow.pl. Archived from the original on April 19, 2014. https://web.archive.org/web/20140419021118/http://www.rzeszow.pl/miasto-rzeszow/wspolpraca-miedzynarodowa/miasta-partnerskie-rzeszowa. Retrieved May 31, 2013. ^ "History". Buffalo-Rzeszow Sister Cities, Inc.. Archived from the original on December 10, 2012. https://web.archive.org/web/20121210013904/http://brsc.us/history/index.htm. Retrieved December 24, 2008. ^ "Tver, Russia – City of Buffalo". City of Buffalo, New York. Archived from the original on September 28, 2011. https://web.archive.org/web/20110928075452/http://www.ci.buffalo.ny.us/Home/OurCity/Buffalo_Sister_Cities/Tver_Russia. Retrieved December 24, 2008. ^ "Buffalo and Drohobych join ranks of sister cities". The Ukrainian Weekly. April 1, 2001. Archived from the original on September 30, 2007. https://web.archive.org/web/20070930033451/http://www.ukrweekly.com/Archive/2001/130120.shtml. Retrieved December 24, 2008. ^ "Lille, France – City of Buffalo". City of Buffalo, New York. Archived from the original on September 28, 2011. https://web.archive.org/web/20110928075308/http://www.ci.buffalo.ny.us/Home/OurCity/Buffalo_Sister_Cities/Lille_France. Retrieved December 24, 2008. ^ Kearns, Michelle (March 16, 2013). "Sister cities, a banquet of international friendships". The Buffalo News. Archived from the original on June 18, 2013. https://web.archive.org/web/20130618050138/http://www.buffalonews.com/apps/pbcs.dll/article?AID=%2F20130316%2FLIFE%2F130319351%2F1057. , Retrieved May 31, 2013. ^ "Buffalo gains sister city: St. Ann, Jamaica". Buffalo News. September 19, 2007. Archived from the original on September 25, 2007. https://web.archive.org/web/20070925055948/http://www.buffalonews.com/cityregion/buffaloerie/story/166115.html?imw=Y. Retrieved December 24, 2008. ^ "Buffalo, N.Y. and Horlivka, Ukraine Foster Sister City Relationship". City of Buffalo, New York. May 25, 2007. Archived from the original on September 25, 2009. https://web.archive.org/web/20090925071237/http://www.ci.buffalo.ny.us/Home/Mayor/Archive_Press_Releases/Leadership/2007Archives/May_2007/BUFFALONYANDHORLIVKAUKRAINEFOSTERSISTER. Retrieved December 24, 2008. Turner, Orsamus (1849). Pioneer history of the Holland Purchase of western New York. Buffalo, N.Y.: Jewett, Thomas & Co.. OCLC 14246512. https://archive.org/stream/pioneerhistoryof1849inturn. French, J. H.; Place, Frank (1860). Gazetteer of the State of New York. Syracuse, N.Y.: R. Pearsall Smith. OCLC 682410715. https://archive.org/details/gazetteerofstate04fren. Severance, Frank H. (1879). "Papers relating to the Burning of Buffalo". Publications of the Buffalo Historical Society. Harold B. Lee Library. Buffalo : Bigelow Bros.. https://archive.org/details/publicationsofbu09seve. Sprague, E. C. (1882) (in en). Semi-centennial Celebration of the City of Buffalo: Address of the Hon. E.C. Sprague Before the Buffalo Historical Society, July 3, 1882. Buffalo, N.Y.: Buffalo Historical Society. Builders' Association Exchange of Buffalo; National Association of Builders (1896). Queen of the lakes, Buffalo, the electric city of the future. Buffalo, N.Y.: The Courier Co. Printers. OCLC 17204632. https://archive.org/details/queenoflakesbuff00buil. Brush, Edward H. (1901). Iroquois Past and Present. Buffalo, N.Y.: Baker, Jones & Co.. https://archive.org/stream/iroquoispastpres00brus. Becker, Sophie C. (1906). Sketches of early Buffalo and the Niagara region. Buffalo, N.Y.: McLaughlin Press. OCLC 12629461. https://archive.org/stream/sketchesofearlyb00beck. Thompson, John H. (1977). Geography of New York State. Syracuse, N.Y.: Syracuse University Press. ISBN 9780815621829. OCLC 2874807. https://archive.org/stream/geographyofnewyo00thom. Dillaway, Diana (2006). Power failure: politics, patronage, and the economic future of Buffalo, New York. Amherst, N.Y.: Prometheus Books. ISBN 1591024005. Goldman, Mark (2007) (in English). City on the edge: Buffalo, New York. Amherst, N.Y.: Prometheus Books. ISBN 9781591024576. http://www.worldcat.org/title/city-on-the-edge-buffalo-new-york/oclc/74648927?referer=list_view. Leary, Thomas E; Sholes, Elizabeth C (1997) (in English). Buffalo's waterfront. Charleston, SC: Arcadia. ISBN 0752408291. https://www.worldcat.org/title/buffalos-waterfront/oclc/38087547?referer=list_view. Myers, Stephen G (2012) (in English). Buffalo. ISBN 9780738591650. https://www.worldcat.org/title/buffalo/oclc/835592368?referer=list_view. Kraus, Neil (2000) (in English). Race, neighborhoods, and community power: Buffalo politics, 1934-1997. Albany: State University of New York Press. ISBN 079144743X. https://www.worldcat.org/title/race-neighborhoods-and-community-power-buffalo-politics-1934-1997/oclc/43296770?referer=br&ht=edition. This page uses content from the English language Wikipedia. The original content was at Buffalo, New York. The list of authors can be seen in the page history. As with this Familypedia wiki, the content of Wikipedia is available under the Creative Commons License.